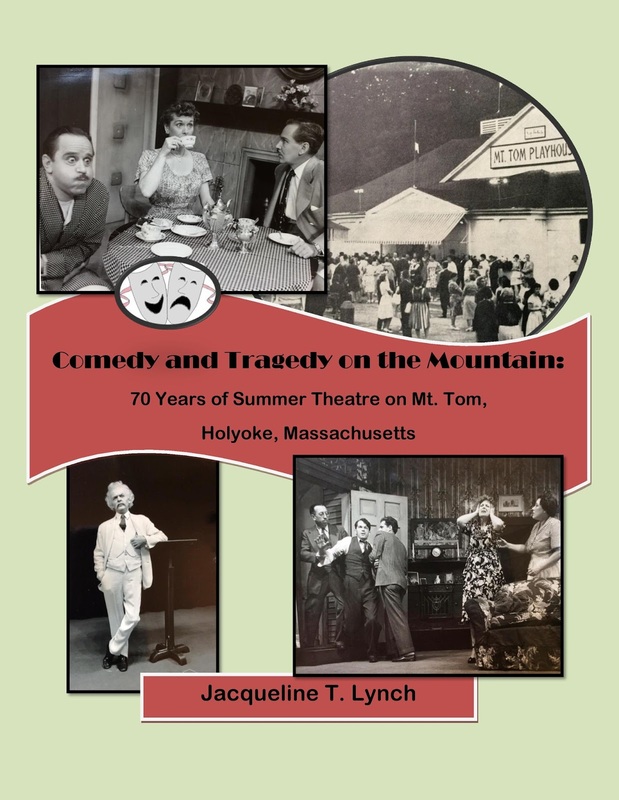 Tragedy and Comedy on the Mountain - 70 Years of Summer Theatre on Mt. Tom, Holyoke, Massachusetts is now published and available in eBook and paperback online at Amazon and CreateSpace, as well as at Blue Umbrella Books in Westfield, Massachusetts. 2nd Encore - Call for memories of theatre on Mt. Tom, Holyoke, Mass. This is to put out a call for memories. In preparation for a book I’d like to write on theatre on Mt. 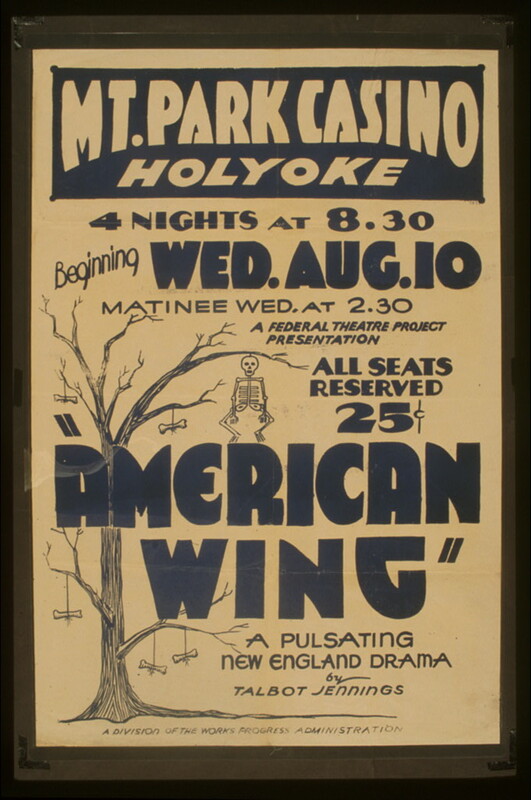 Tom in Holyoke, Massachusetts, I’d like anyone to contact me who is willing to share memories of experiences either as a member of the staff, an actor, or one of the audience. Live theatre had seen different incarnations on Mt. Tom, some of which were discussed in thisprevious post. The old playhouse, called The Casino at one time, hosted the Casino Stock Company in 1911. 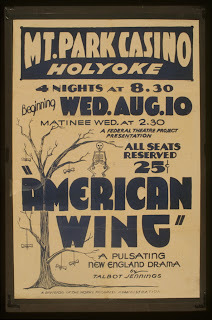 In the 1930s there were the WPA-sponsored shows, and in 1941 came the heyday of Mt. Tom theatre with The Valley Players, some of whose members, including Hal Holbrook, went on to greater fame. 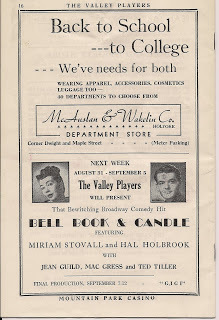 In the early 1960s, with the discontinuing of The Valley Players, the Mt. Tom Playhouse played host to a variety of touring shows featuring well-known actors and actresses. 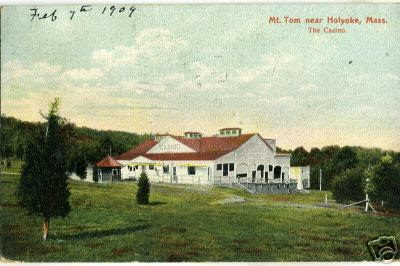 The Casino is gone now, and Mountain Park was closed in 1987. I’d appreciate hearing from anyone with memories of theatre at Mt. Tom. Either leave a comment or send me an email at: JacquelineTLynch@gmail.com. I’d also be happy to conduct phone interviews or in person. Just drop me a line and let me know. Thank you. A reader, John Y., recently contacted me with these two great scans of postcards of the Tremont Theater. Though this blog has been on hiatus, I had to share them (and I'll post them as well on my New England Travels blog where my theater posts are now going). His contribution is in response to this past post on Boston's Tremont Theater. 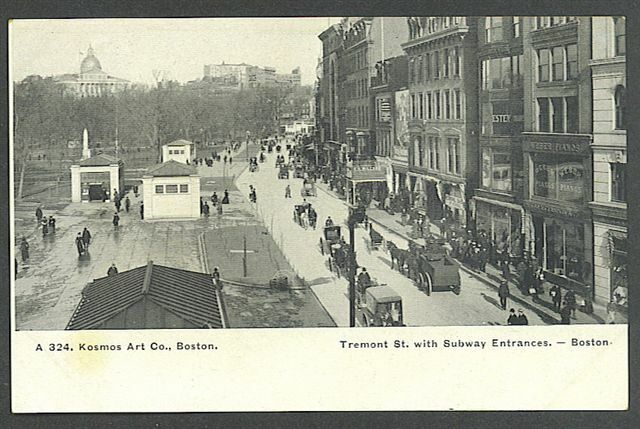 From John Y.: "Here you'll see an early, say, 1905 view of Tremont Street looking north towards Park Street. Just a hair to the right of center, if you look carefully, you'll be able to make out the "Tremont Theater" sign on the front of the marquis, the same as is on the first post card. On the right side of the marquis is "C. S. either Millard or Willard". The dance studio is upstairs and just to the right of that sign is a two-story tall Quaker Oats mural. Other businesses readable are Estley Organs and Weber Pianos. I'm confident that the white stone building at the right edge is the Masonic Temple. 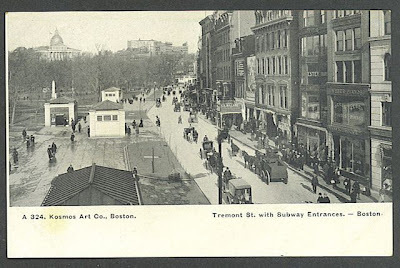 Printed in Belgium for Kosmos Art Co., Boston, this view is dateable mostly because of the lack of electric and/or gas engine vehicles and the existence of the subway. One of your bloggers, Herb, I think it was, correctly determined that the Astor Theater did occupy the building after our Tremont Theater. If you or any of your friends would like, and you wouldn't mind being the connection, I'll be glad to share whatever views I have of the City. Just let me know what and whaere and I'll check my stuff." Ruth Gordon in her autobiography remarks on the poignant cry of the stage manager when places for the final act of a closing show is announced to the players. Instead of calling “Act Three”, he calls, “Last Act”. This is the last act for “Tragedy and Comedy in New England”, though not entirely a farewell. 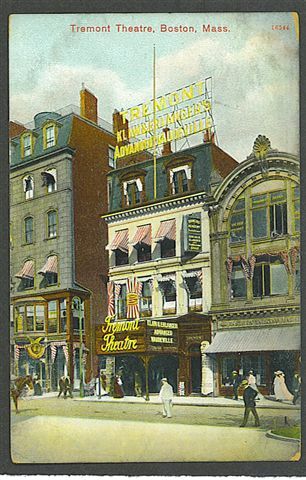 Though I will not be continuing this blog due to a work load that requires more of my attention elsewhere, I will continue to post on the history of theatre in New England on my other blog, “New England Travels”. 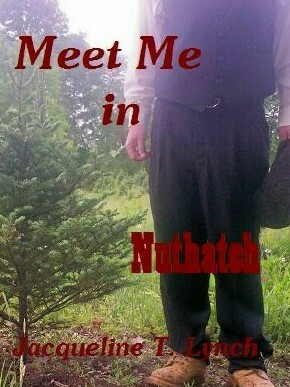 I hope you can join me there. In the meantime, I will leave this blog up as it is for the near future, but will disable further comments. Let’s not ring the curtain down; let’s just move the show to a different stage. Book review blog, “MotherLode” has recently reviewed my novel “Meet Me in Nuthatch”, available as an ebook through Amazon.com, Barnes & Noble, and Smashwords. Panned in Boston - John Philip Sousa's "Desiree"
One may ponder if the audiences of Philadelphia and Washington are less apt to spot “rot” than a New England audience, but one has to admire the old world flourish of condemnations like “rot”. “Desiree” was a comic operetta whose score was composed by the famous “March King” John Philip Sousa, with libretto by Edward M. Taber. Perhaps the above critic’s opinions were not unfounded, as the libretto was later revised by Jerrold Fisher and William Martin. It had premiered several months earlier at the National Theater in Washington. De Wolf Hopper, a 6-foot, 5-inch mountain of a man, which in theatre terms made him more appropriate for comic roles than heroes, later went on to fame delivering recitations of the poem “Casey at the Bat”, which he also occasionally did for curtain calls. Perhaps that might have saved the play here. George and Sarah Bartley, players on the English stage from the late 1700s through the early 19th century, came to America on tour in 1818. It was a great success for them, but one episode in Hartford, Connecticut put a dent in their shiny newfound fame and fortune. They took the stagecoach from New York City to Boston, and stopped in Hartford for a rest. 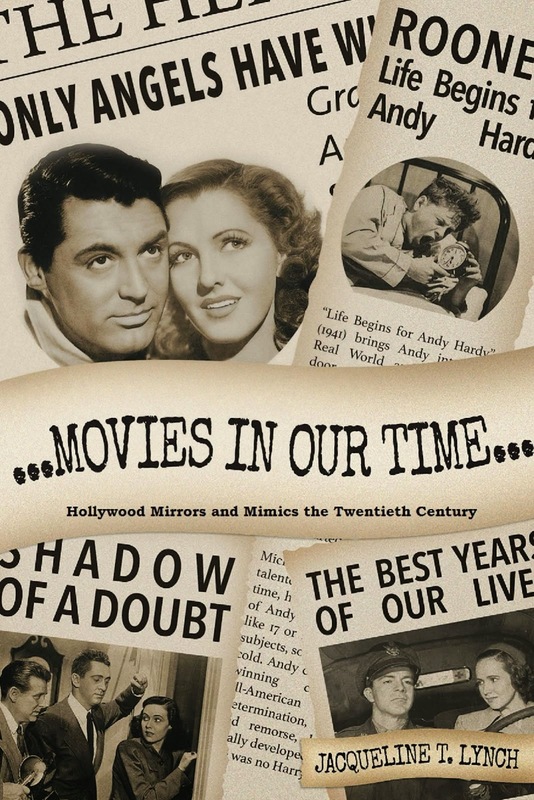 According to Curtain Time - The Story of the American Theater by Lloyd Morris (Random House, NY, 1953), some prominent citizens in town invited them to present readings from plays and recitations. It wasn’t every day famous theater folk came to town. Probably because they had no theater. There were reasons for that, as we shall see. The ballroom of Hartford’s “principal hotel” made do, but, this being New England, several more puritanical town fathers voiced opposition and demanded that the Attorney General of Connecticut “enforce the ‘blue law’ prohibiting theatrical performances and circuses.” Theatre, as we know, is a vice. The Attorney General duly forbade the landlord of this establishment to hold his planned entertainment, but the landlord did not tell Mr. and Mrs. Bartley. So, on went the show in theatre tradition, and the thoroughly confused couple were immediately arrested after their bows, which the author notes was after midnight. Bail was set at $500, more than a princely sum in the new republic, but fortunately, their hosts paid the bail. The court eventually let the Bartleys go, likely skedaddling up the Old Post Road with fresh horses. One hopes they had a better reception in Boston.